Growing up, Sunday mornings at mum and dad’s was always a foodie’s paradise, and we didn’t even know it. Long before blogging and MasterChef, ethnic kids (like me) would turn their noses up and complain about the weird and wonderful foods of their motherland. When it comes to this dish, I must confess – this was me. I think I only pretended to dislike it because I wasn’t mature enough to appreciate the strength of raw garlic in food, but that soon changed. Now that I’m looking back, I think mum knew exactly what she was doing, loading up her teenage daughters on raw garlic and sending them off into a big wide world of cute pubescent boys. PS. It’s vegan and without the pita, gluten free too. In a mortar and pestle, pound the garlic with the salt to a creamy pulp. Add the fresh lemon juice and olive oil, set aside. Empty the beans into a strainer and rinse the brine off with cold running water. Once the pot has come to a gentle boil, strain the beans and place into a serving dish. With a fork, roughly mash half of the beans, leaving half of them whole and fold together. Briskly mix the oil, lemon and garlic mixture and pour over the warm beans. Garnish with the chopped parsley and tomato. 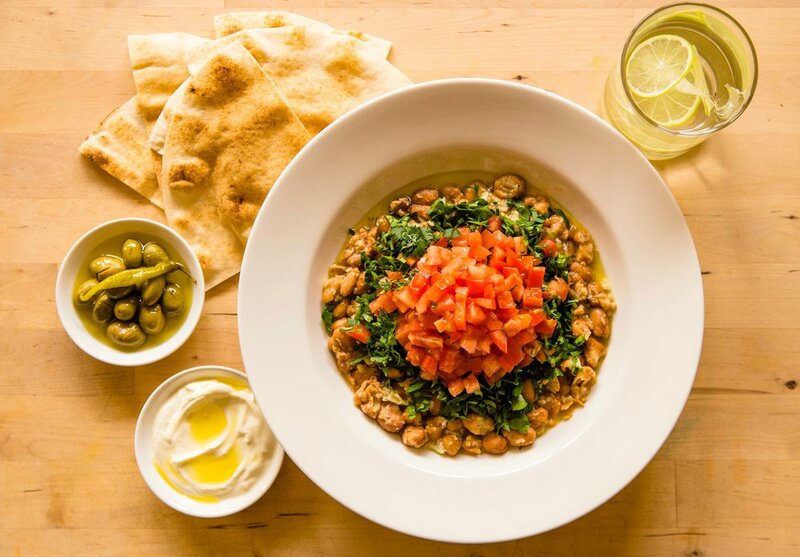 Finish with a generous drizzle of olive oil and serve with warm Lebanese or pita bread. Amazing with olives, and labne!